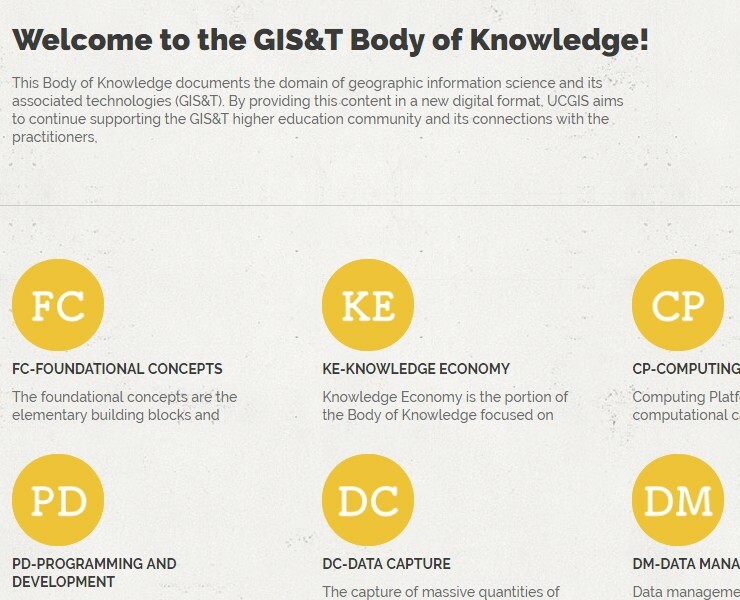 The digital version of the Geographic Information Science & Technology Body of Knowledge (BoK) is now online at gistbok.ucgis.org! This dynamic, digital platform supports more innovative and applied uses of this knowledge. We have put in place a stable information architecture combined with robust strategies for content management and curation. UCGIS is eager for new audiences, including natural learning communities focused on various domain areas or interests (e.g. Critical GIS, CyberGIS, Geodesign and Sustainability, among others) and other non-technical end users to interact and engage with these materials. Interested in contributing as an author or a reviewer? The Editorial Team invites subject matter experts with interests in writing or reviewing Topics to contact them. Potential authors should review the Guidelines to get started. Summer and Fall 2017: Phase 2 begins and additional functionality will be added to the site, including text-based analytical operations and customized printing options. Fall 2016: the Editorial Team engages authors to revise and expand existing Topics and contribute new ones in an ongoing process to keep the GIS&T BoK current. December 2014: Final report from the Pasadena Symposium, authored by John Wilson, published. Fall 2014: Draft and distribute a Needs Assessment for the curation of the content going forward. May 2014: During the May 19-21 Symposium in Pasadena, review the initial survey data sets; gather input on additional knowledge, tools, and applications; and review platform functionality and design. Spring 2014: Design and widely distribute two surveys that collect information on 1) the relative importance and relevance of the original 329 "topics" that were included in the original BoK and 2) new topics that ought to be added in the revised version. Winter & Spring 2014: Consult with those involved in the Geographic Information: Need to Know (GI-N2K): Towards a More Demand-driven Geospatial Workforce Education/training System project that was recently funded by the European Community. Fall 2013: Invite and organize a Steering Committee as a initial and preliminary step towards a new governance model. Many of these Steering Committee members to later become Knowledge Area editors. Much has changed in the domain of Geographic Information Science & Technology since the first edition of the GIS&T Body of Knowledge (BoK) was published in 2006 (DiBiase et al. ); PDF version available for free download here. The BoK was an essential contribution to this field of information science, but it is time to revisit its content, both to consider additions as well as exclusions. In late 2012, UCGIS asked Dr. John P. Wilson, from the Spatial Sciences Institute of the University of Southern California, to lead this revision effort. The process has been lengthy but well thought through to meet the final goals. The UCGIS leadership believes that the work invested in shaping the next GIS&T Body of Knowledge platform will provide some of the fundamental building blocks for a broader and more inclusive spatial science and for a further maturation of the GIS&T field.